This book covers OJS version 3.1, released in October 2017, and features significant enhancements over the previous versions of the software. We hope you find it helpful for your publishing projects. OJS is a journal/web site management/publishing system. OJS covers all aspects of online journal publishing, from establishing a journal website to operational tasks such as the author’s submission process, peer review, editing, publication, archiving, and indexing of the journal. OJS also helps to manage the people aspects of organizing a journal, including keeping track of the work of editors, reviewers, and authors, notifying readers, and assisting with the correspondence. OJS is flexible and scalable. A single installation of OJS can support the operation of one or many journals. Each journal has its own unique URL as well as its own look and feel. OJS can enable a single editor to manage all aspects of a journal and the journal’s website, or OJS will support an international team of editors with diverse responsibilities for a journal’s multiple sections. OJS supports the principle of extending access. This system is intended not only to assist with journal publishing, but to demonstrate how the costs of journal publishing can be reduced to the point where providing readers with “open access” to the contents of the journal becomes a viable option. The case for open access is spelled out over a wide series of articles stemming from this project which are freely available under Research > Publications on the Public Knowledge Project website. The origins of OJS. The system was first released in 2001 as a research and development initiative at the University of British Columbia, with the support of the Social Sciences and Humanities Research Council of Canada, the Max Bell Foundation, the Pacific Press Endowment, and the MacArthur Foundation. Its continuing development is currently overseen by the Simon Fraser University Library. For more information, see the Public Knowledge Project website. OJS 3 is significantly different than its predecessor, OJS 2. It includes enhancements and new features developed from community feedback, extensive usability testing, and new software design capabilities. 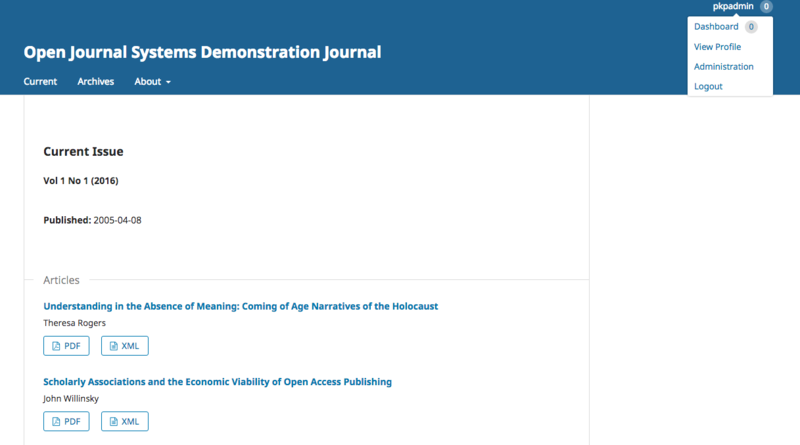 The following image is a screenshot of an OJS Demonstration Journal Table of Contents. You can see from the screenshot that the user functions now exist from your profile menu at the top right of the screen. This takes the managerial content in OJS 3.x away from general user view. Side bar information is clearly broken out, as well as your top navigation bar with collapsible menus for the “About” functions. Like OJS 2, each article has a linked title for viewing object metadata and abstracts, and galleys are now clearly labeled below the titles with clearer logos. Top Navigation Bar: To the left, you will find the name of the journal you are currently working with (e.g., Journal of Public Knowledge). If you are enrolled in more than one journal on this OJS installation, you can use this to switch between journals. Next to that are your Tasks (items needing immediate attention). To the right, you can switch languages if the journal is multilingual, view the reader interface, or click on your username to view your profile or logout. Left Menu Panel: These are the major sections of the dashboard, including the submissions, issue management, subscription management (if you are running a journal using subscriptions), settings, user and role management, and tools. Users with fewer permissions (e.g., Authors, Reviewers, Copyeditors, etc.) will see fewer links here. Main Panel: In the main panel you will see the current work area. In the image above, you are looking at a submission record in the Production stage. Excellent examples of community contributions include the vast array of languages that OJS is available in; and third-party plugins posted to the community forum and the archived forum page. We also welcome software testing and bug reporting contributions. A community forum and issue reporting system for technical issues can be accessed via the PKP web site. For questions about a particular journal site, such as submission requirements, contact that journal directly, using the contact information listed on the journal’s About page.